It's that time of year again where those of us who are madly in love with coffee celebrate two of our favorite things. 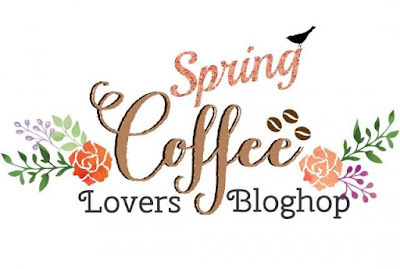 I absolutely adore the Coffee Lover's Blog, and the Spring hop is my favorite. Why? First, Flowers. Which shockingly I did not use on this card. Second, I am never without my coffee. For real. I have no idea how my body runs on so little water. ;/ I'm basically walking around like 82.9% dehydrated at all times. I'm sure of it. I wanted to try something a little out of my comfort zone since this card was strictly for fun :) I put together a quick video showing you how I got there. I hope you enjoy! I really do like how the background came out even if I'm not doing kart wheels over the whole card. Part of the fun in crafting is learning what you like and what you don't like. However, that Aurora Borealis sky sounds pretty cool. I might actually give it a try. Very nicely done! I love the patterned countertop you created. Ohhh, this is awesome!! I love it, Kelly! Such a creative design with the stacked cups! Haha what a great sentiment. Beautiful card! Fabulous - like all of the cups stacked up - great video too! love all the stacks of cups, and particularly love your sentiment...great card. Very fun card with those stacked cups. This is just the cutest coffee card ever!!! Yes... that looks like just about the right number! So cute! Fabulous card, Kelly, love all the cups! Happy Sunday and Happy Hopping! Great video and really neat card. um, wow! Love your stacked cups and your background is awesome. LOVE your SUPER stacks of cups, LOVE your PRETTY colours and LOVE your FUN sentiment too!!! Wow!!!!! Thanks for the video! Great masking and nice background!!! Wow! This is jaw dropping awesomeness! Wonderful card, background, and love that fun sentiment. Gorgeous colors on your uber fun card! Wow Kelly, this card is beyond fabulous! Love all of the fantastic detail you added...that background, the checkerboard base, and the Wink of Stella! Your color wash is beautiful. I love the stack of cups and the sentiment. Now I have to go watch how you made the color wash.
Love the stacked cups and the watercolored background! what an awesome stack of cups with the beautiful water colors! Cool background - that masking was a LOT of work! That background is fabulous. I LOVE the stacks of cups!! they look fabulous!! Love it! Love the background and stacks of cups! Awsome cardand great tutorial, thank you. Your card is wonderful!! Thanks for sharing. Love how you adapted the bottom of the card when you weren't 100% pleased. So nice to show that instead of starting over.﻿ You are definitely dedicated to coffee, when you can stack that many cups together in one card! This is so cute! I love the beautiful color blend too! Love your fun stacks of cups and that great sentiment! beautiful background too! love all the cups and the sentiment! Such a fun background! That's a lot of coffee cups. fun! Beautiful background! Love the tiny stacked cups! beautiful card and fun sentiment for the stack of cups! thanks for the video!